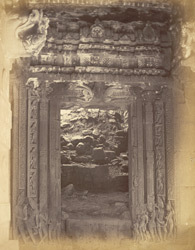 Photograph of the doorway of the shrine of the Durga temple at Aihole, in the Bijapur district, taken by James Burgess around 1874. Aihole was one of the capitals and an important commercial centre of the early western Chalukya, a powerful dynasty which ruled the Deccan from the 6th century. Together with the two other capitals of Badami and Pattadakal, the site has preserved many Hindu and Jain temples which belong to a period that goes from the 6th to the 12th centuries, belonging to the early and late Chalukya periods and to the Rashtrakuta era. The Durga temple is a large and elaborate Hindu temple belonging to the late 7th century, Chalukya period. The temple, which has an apsidal-ended plan, is elevated on a platform and surrounded by a colonnade. The columned mandapa that leads to the semicircular sanctuary has an elaborate doorway with river goddesses and guardians in high relief at either side. At the centre of the entablature there is the image of Vishnu's vehicle Garuda grasping nagas or snakes symbolising his protective function for the worshippers.